You started your blog during university, how did the idea for it come about? When I was 15, I helped set up a fashion magazine at school. I wrote tonnes of articles for it but when it went to print there wasn’t space for all of the articles. 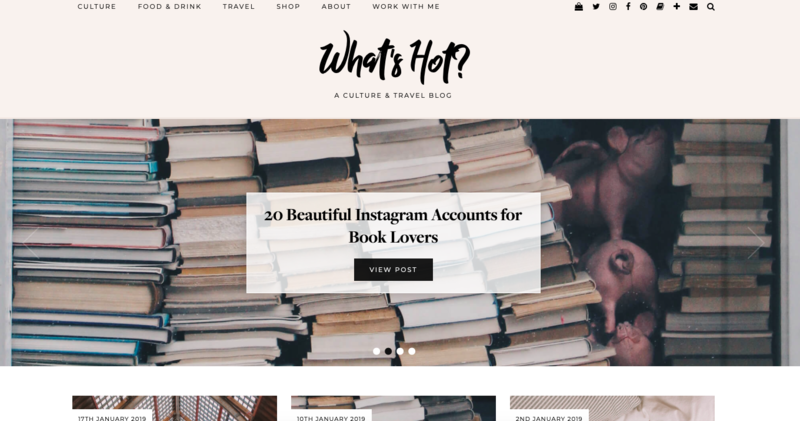 Not wanting them to go to waste, I started my blog and What’s Hot was born! Yes… it started as a fashion blog. I quickly realised that wasn’t for me and then it became a dedicated book and film review blog. Years later when I went on my year abroad, I realised I wanted to write about other things too, so I expanded to lifestyle and travel. I’ve honed it back down again to just two topics that I tend to cover: books and travel. Sometimes I still write about lifestyle and food, but it is largely a culture and travel blog. 2. Talk to me about your career as a lawyer…where are you now and how does it inspire your content creation? I received a job offer from a law firm in my penultimate year at Oxford, so it was quite a long time ago now! 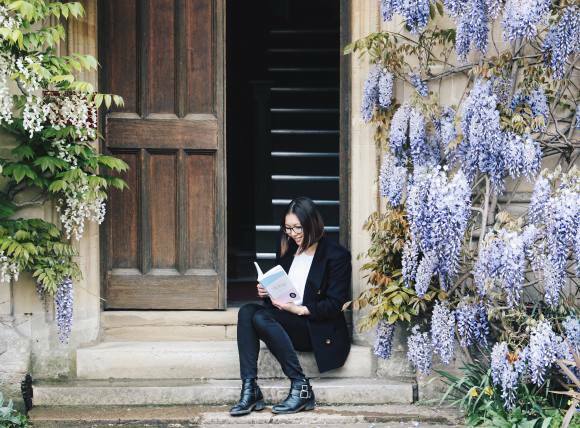 After receiving the offer, I finished up my French degree at Oxford, then started the law conversion course in London. After I finished that I decided to take 6 months out to travel and focus on my blog. I’m just starting the second half of the law conversion now and as I’m doing an accelerated version, I’ll be done by July and working in August! A more detailed story about how I ended up on the road to becoming a lawyer can be found on my blog here. I tend to keep my studies and blog quite separate, so the law aspect of my life doesn’t hugely impact or inspire my blog content! 3. If you could go back to your first year of university, what’s the one thing you would recommend career-wise to anyone and why? My number one tip for first years is to make sure that you study hard for exams from the get-go because they will alwaysbe on your record, even if they don’t contribute to your overall degree in the end. My first-year grades didn’t count towards my final grade and I only needed to pass the year in order to progress to second year, so I didn’t take them seriously at all and I sorely regretted it later on. For many jobs (definitely corporate jobs) you’ll need to enter your grades from around GCSE year all the way through to whatever stage you are at. There’s no way to hide your previous record so make sure it’s pretty consistent all the way through! I’d also recommend attending career fairs and networking events from first year. These tend to involve lots of freebies and free drinks so there’s no harm in turning up, having a quick chat about your options, grabbing the freebies and dashing away again! 4. What are your set-up must haves for anyone wanting to start their own blog? To be honest, the set-up costs and requirements are very low in the blogging industry, which is why it’s so great! As long as you have something you can use to take pictures, such as your phone, and something to write with, such as a laptop, then you’re good to go! Since most people have both of these items anyway, pretty much anyone can set up a blog. However, I do think that you need your site to be self-hosted if you want to be taken seriously. That means no .wordpress.com or .blogspot.com. The cost of this varies depending on which provider you choose to go for but can be as little as £10 a year! 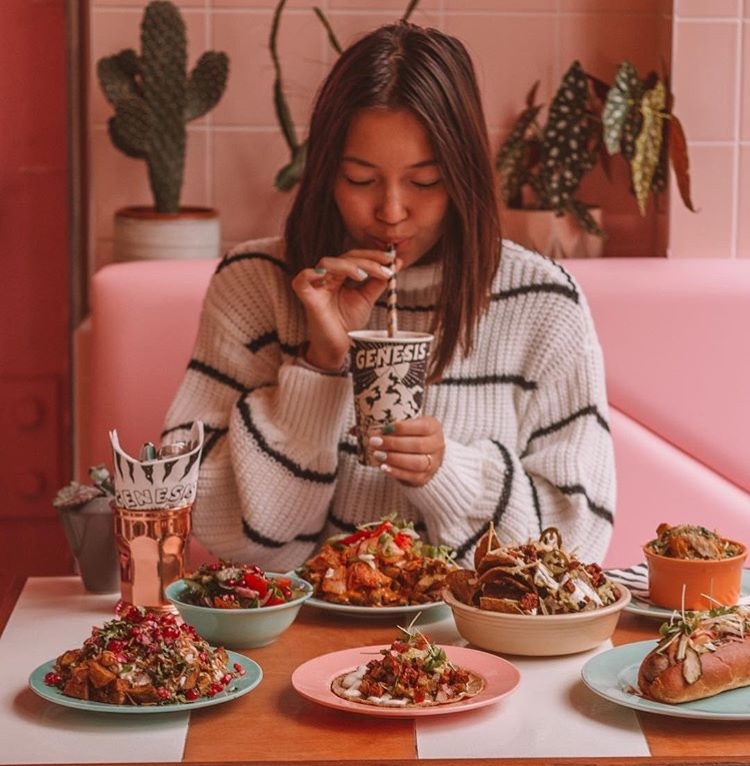 If you’re hoping to monetise your blog and work with brands in the future, then you should do this right from the start so you can build up your authority and you won’t have to rebrand later. Having a good theme from the beginning is also a good idea as a messy or basic blog can drive potential readers away. There are loads of themes available for free, but you can also buy them for better quality themes that you can personalise. Etsy or Pipdig are good places to start looking. Another good idea is to try and write at least five posts before you launch and start promoting your blog. This way it will be obvious from the start what your blog is about and what sort of content people can expect from you and you can start building up a loyal following immediately. 5. Okay, investments…sometimes they can be worth it in the long run, what are your top 3 purchases worth investing in and why? To take your blogging to the next level I think a good camera is absolutely essential so that you have high quality images. This is especially true if you are in a niche such as fashion, travel or food where the photos play a huge role in the post. The iPhone only route is perfectly possible for people who are just curating an Instagram feed but despite the amazing iPhone cameras out there you just can’t beat an actual camera for quality when the photos are blown up on a website. I’d say you’re looking at an investment of £350+ here though so it’s not a decision to be taken lightly! Another photography investment is a subscription to Adobe Creative Cloud. You could buy applications like Lightroom or Photoshop but they are very pricey and that means once your version is out of date, you’re stuck with it! Instead I pay £10 a month (student price) for a subscription to Adobe CC so I can use Lightroom CC. This is what I use to edit all my photos for my blog and Instagram account and it has done wonders for the consistency of my Instagram feed! As you grow, there are tools you can use to automate and schedule posts for social media. This will save you a heck of a lot of time! It also means you don’t have to be glued to your phone all day. The only one I use at the moment is Tailwind for Pinterest, which automatically pins your posts and other people’s posts every day. There are others such as Buffer or Hootsuite which can schedule to other social media websites like Twitter and Facebook. 6. Let’s talk apps…everyone wants the perfectly branded photo, how do you achieve yours? I take the majority of my photos on my camera (an old Canon 100D). Then I edit them using Adobe Lightroom, which I mentioned above. I have developed my own presets on here (presets are like fancy filters) which I apply to every photo, making a few small adjustments. When I first started using Lightroom I bought some preset packs from Etsy to play around with, so I’d recommend looking there when you’re just starting out. Then I’ll use the app Mosaico, an Instagram feed planning app which costs £5.99, to see how all my photos for the week will fit together. 7. 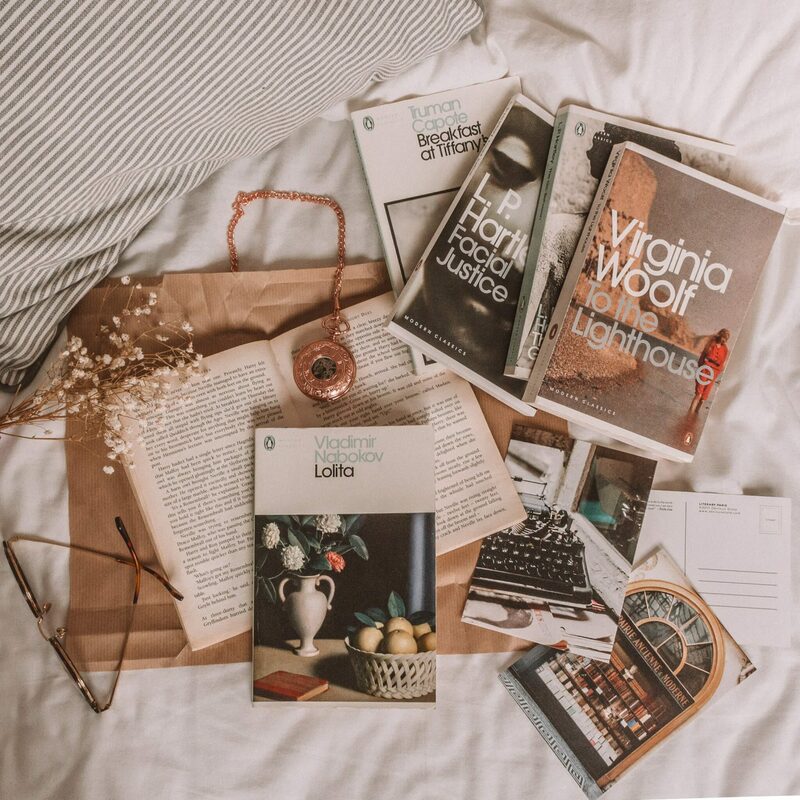 As a fellow book lover myself, I always enjoy your blog posts and how you incorporate travel in them as I’ve been hit by the travel bug too. Can you tell me why it’s important for you to incorporate both and why niches are a necessity to anyone wanting to make a real side-hustle from their blog? I don’t think having a niche is absolutely essential to be a successful blogger. However, I will admit that it is SO much easier to grow and build a loyal following when you’ve got just one or maybe two niches. 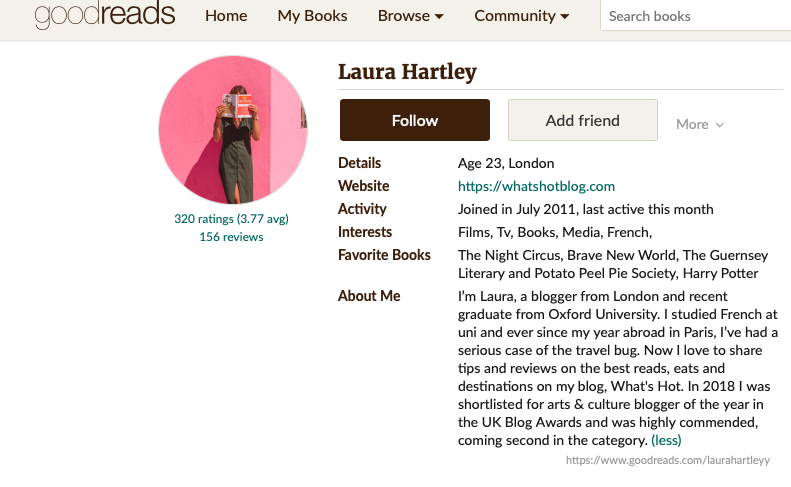 I’ve flitted between multiple niches for over 8 years but now that I’ve finally settled upon books and travel, I find it a lot easier to come up with content ideas and know exactly where I’m going with my blog and what I hope to achieve. It can be tempting to just write about lots of other things because you can. 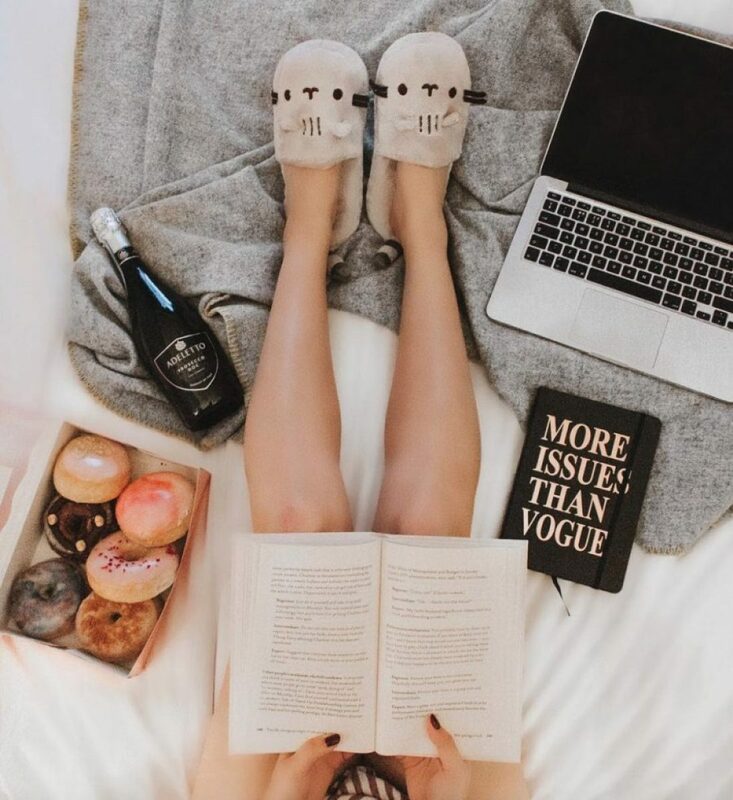 However, if you’re playing the long game when it comes to blogging and perhaps trying to make a career out of it then you should think about how all your posts tie together from a reader’s perspective rather than just coming up with random post topics. This has helped me grow immeasurably over the past 2 years. For me, combining books and travel is a challenge that I embrace as it means I get to explore cities with a completely different mindset to most people. Sharing this with like-minded book and travel lovers and encouraging them to see the literary references in the world around them too is amazing! 8. I know this is a big ask…what are your top 5 literary experiences to date and why? A tough question! 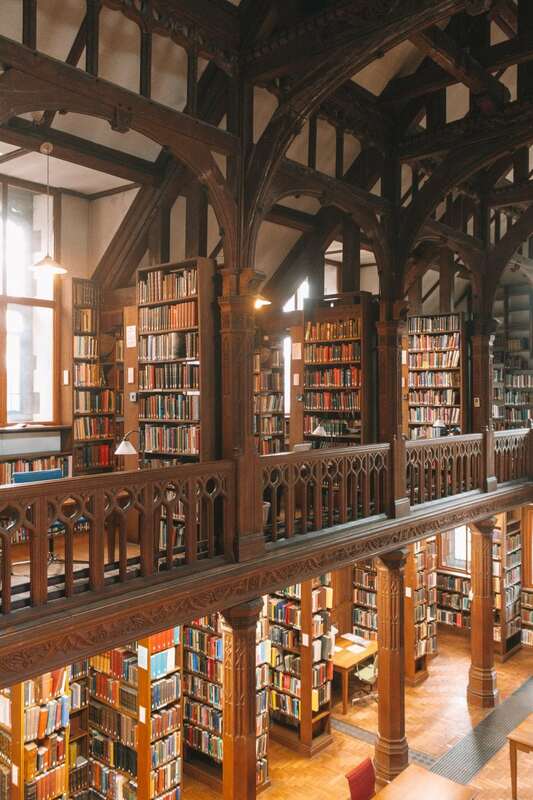 I’ve stayed in a number of literary hotels, but my favourite has to be Gladstone’s Library in Wales. 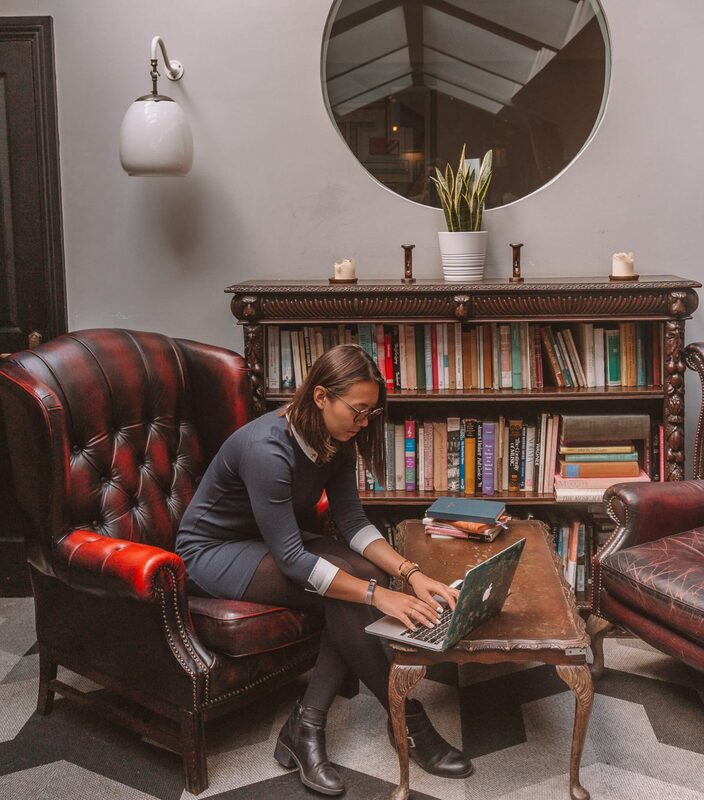 It’s the UK’s only residential library and the perfect place to go when you want to escape the hustle and bustle of real life. I’ve also been to a number of literary bars and my favourite is The Blind Pig in London. The drinks are all inspired by children’s stories and the Winnie the Pooh one is served in a “Hunny” pot! 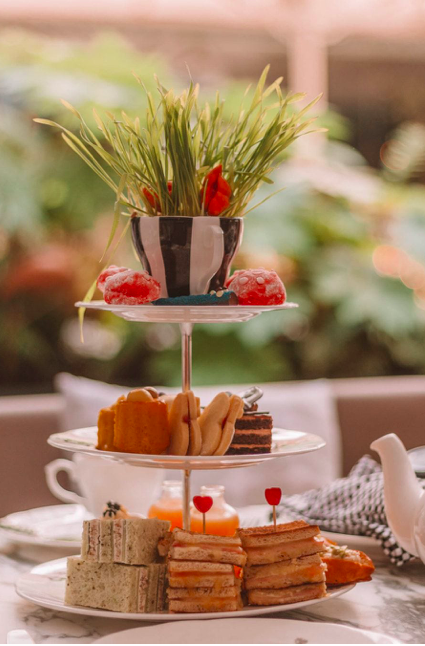 Also in London was an Alice in Wonderland themed afternoon tea hosted by Sanderson London. Sadly, this was only for a limited time, but it was wonderful to visit in the summer with my mum. It was the tastiest afternoon tea with each and every piece of food decorated to suit the Alice in Wonderland theme. They’d also created their own teas which were named after characters from the book and were served in crockery inspired by the story too! I visited Copenhagen last November and went on a tour of the beautiful Royal Library. It’s a mixture of old and new and the story behind how it was constructed is fascinating! I wrote about it in my guide to Copenhagen for book lovers. 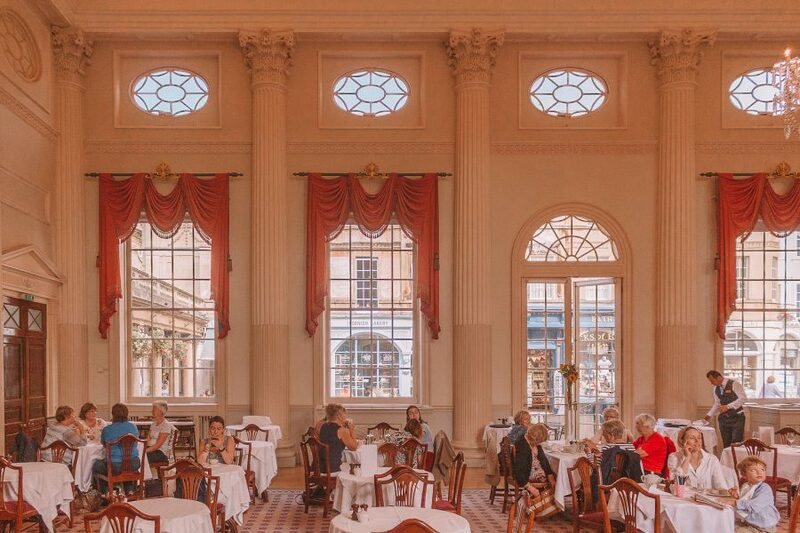 Lastly, I visited Bath in 2018 and went to the Jane Austen museum they have there. I learnt about all the connections the city has to Jane Austen and how her relationship with the city changed over her lifetime. What was most fun though was dressing up in period dress, in clothes Austen’s would’ve worn! 9. It’s 2019! I can’t actually believe how quickly last year went, but let’s discuss your exciting plans for (still feels weird saying it) this year? As I’m going back to law school and beginning work later in the year, I haven’t got many concrete plans for the year when it comes to blogging. I have a lot of travel posts planned for places I know very well (London, Paris, Oxford) but also places I visited during my 6-month break, including California, Copenhagen, Italy and Spain. Lots of literary travel will be thrown into the mix there. You can also expect more book recommendation lists as opposed to in-depth book reviews!